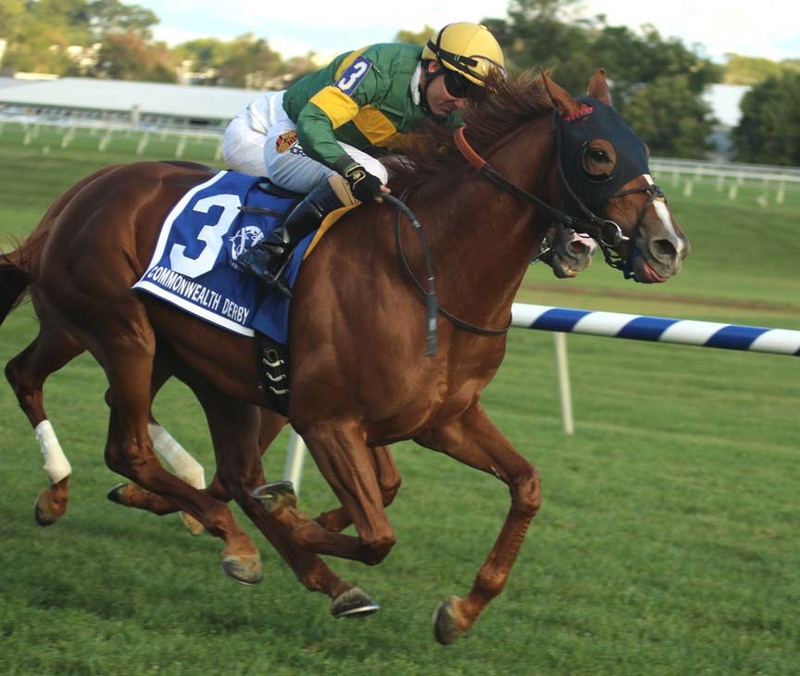 Skeedattle Associates’ Just Howard, winner of the Grade 3 Commonwealth Derby at Laurel Park as part of a four-race win streak over the summer of 2017, took home top honors as Maryland-bred Horse of the Year, champion 3-year-old male and champion turf horse. The announcements were made at the inaugural Renaissance Awards, a cooperative effort between the Maryland Horse Breeders Association, Maryland Thoroughbred Horsemen’s Association and Maryland Jockey Club created to recognize excellence in Thoroughbred racing and breeding in Maryland in 2017. The event was held on Monday evening, Feb. 12, at the Sagamore Pendry hotel in Baltimore. Just Howard, a son of champion English Channel trained by Graham Motion, didn’t break his maiden until his sixth career start, a maiden special weight on the turf at Pimlico last May. He returned in July in stakes company, winning the Caveat over the Laurel Park turf as the even-money favorite. One month later, he added the Find Stakes over older state-bred rivals. His final win of the season was his biggest, as he set a course record while pulling away in the Commonwealth Derby, getting a mile and an eighth on the turf in 1:45.81. Bred by the late Howard Bender, who was named 2017 Maryland Breeder of the Year, Just Howard was foaled at Glade Valley Farms in Frederick, Md. The third foal for the Alphabet Soup mare Aruban Sandwich, he descends from Sondra and Howard Bender’s famed foundation mare Foufa, the dam of five stakes winners, including graded turf winner Foufa’s Warrior. Skeedattle Associates, a Clarksville, Md.-based three-person partnership, purchased Just Howard as a yearling for $37,000 at Keeneland September out of the dispersal of Bender yearlings and named him in honor of the breeder said Robert “Willie” White, spokesman for Skeedattle and current president of the Maryland Horse Breeders Association. Also presented were the annual breeder, stallion and broodmare of the year awards. In addition to Bender’s award, Northview Stallion Station’s Great Notion earned his second consecutive stallion title, and Robert T. Manfuso and Katharine M. Voss’ Parlez, the dam of four stakes horses including millionaire International Star, was honored as broodmare. Champion 2-year-old male: Whirlin Curlin (ch.g., 2015, by Curlin—Lexington Girl, by Storm Cat). Bred and owned by Marathon Farms Inc.; trained by Gary Capuano. Champion 2-year-old filly: Limited View (b.f., 2015, by Freedom Child—Loves to Glance, by Not For Love). Bred by Barbara G. Smith; owned by John E. Salzman Jr., Fred Wasserloos and George Greenwalt; trained by John E. Salzman Jr.
Champion 3-year-old filly and champion sprinter: Crabcakes (dk.b./br.f., 2014, by Great Notion—Aunt Elaine, by Charismatic). Bred by Buckingham Farm; owned by Morgan’s Ford Farm; trained by T. Bernard Houghton. Champion older male: Struth (ch.g., 2012, by Curlin—Star Number, by Polish Numbers). Bred by Fitzhugh LLC; owned by Mark Sitlinger; trained by Kieron Magee. Champion older female: My Magician (b.m., 2012, by Street Magician—My Rib, by Partner’s Hero). Bred by Dr. and Mrs. Thomas Bowman, Brooke C. Bowman and R. Larry Johnson; owned by Euro Stable; trained by Claudio A. Gonzalez. Champion steeplechaser: Swoop (b.m., 2010, by Louis Quatorze—Admonish, by Caveat). Bred and owned by Mrs. Thomas H. Voss; trained by Elizabeth Voss. Voting for this year’s divisional champions were Mid-Atlantic Thoroughbred editors Joe Clancy and Cindy Deubler and senior writers Sean Clancy and Tom Law, Maryland Jockey Club president Sal Sinatra, racing secretary Georganne Hale, stakes coordinator Coleman Blind, track announcer Dave Rodman and racing analyst Ty Ehlis, Bill Brasaemle and Keith Feustle of Equibase, THAracing.com managing editor Tom LaMarra, freelance writers Andy Beyer, Ted Black, Maggie Kimmitt, Vinnie Perrone, John Scheinman and Dan Tordjman, The Racing Biz publisher Frank Vespe, WBAL NewsRadio reporter Scott Wykoff, radio host Stan Salter and photographer Lydia Williams.